TABL014 Long & Low Seasonal Table Centre Arrangement [TABL014] - $0.00 : Hanamo Florist Online Store, Vancouver, BC, Canada, Quality arrangements using a plethora of the freshest flowers. Current Price - Honorably arranged for Japanese Emperor and Empress to their hotel suite's dining table on their visit to Vancouver, BC in July, 2009. 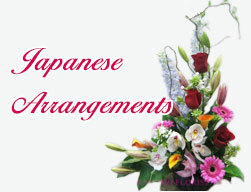 Flowers are seasonal, colour theme can be up to your request.